One fine Saturday did this experiment and which become hit :). Simple, fast and tasty baigan. 1. Cut the eggplant in circles. 2. Mix all the ingredients except oil or butter and marinated with eggplant slices for 10-15mins. 3. Preheat oven, place eggplant pieces in the griller and brush eggplant pieces with apply oil or butter . 4. Grill for 10 mins. Turn the eggplant pieces brush with oil again and grill for 10 more mins. 5. If eggplant is not cooked then grill for 10-15 more mins. 6. Tasty, yummy, spicy eggplant is ready to serve. It's okie if there is no oven or griller, use tawa for the same. Hi Priti, thanks for the entry to MM event! See you at the round up. this one looks nic for the event,..congratsfo the award nd thnaks for passin to me,.. lovley..I have tasted them at my friends place in Patna. My friend's dad used to grill lovely eggplants..your post brought back the memories..
nice one...maybe I can use some vege. masala..will try!! Thank you so much for the award. AM really honored. Wow that looks gr8. Congratulations for the award. Hi, thanks for stopping by my blog. I agree...my son has a better collection. 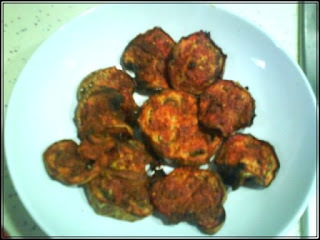 Grilled eggplant are always yummy :) Love the way u made it spicy! Great entry! Congrats for the award and the eggplant looks so good. superb grilled baigan....ye tho hit nahi,balki super hit kahooo...i too have tryed this..i luved it..
pls check my blog.. surprise is there.. Thanks for dropping by Priti. I learnt this from the Kolkata side of my family, using mustard oil, salt and turmeric! Using masala powders is a nice variation. I love grilled eggplant and the flavours you add to it makes it sound even better!! I too love eggplants from the grill! Lovely1 Thanks for joining us at the MM! lovely recipe priti....i can just imagine tasting the grilled spicy eggplant bits.